If you've watched my recent French Haul video (click here to view), then you might recall that I received a sample of Bio Beaute by Nuxe Nourishing Mask with Apricot Kernel Oil and Almond, along with my purchases. Designed for very dry and damaged hair, I was worried that the mask would prove too rich for my fine hair but as I've been using my straightening irons quite a bit recently, I decided to try it. The full size of the mask is presented in a tub format and regular readers will know that I prefer tubes- they're more hygenic, less messy and less bulky in my ever more crowded bathroom. 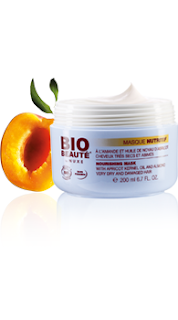 The "Bio Beaute" name is a little misleading- the products aren't completely natural or organic but more so than most and it holds the prestigious EcoCert mark, with this mask being comprised of 98.9% natural and 10.9% organic ingredients. These initial negatives were quickly forgotten upon opening the sample as I was hit with an incredible scent- the creamy mask smelt just like marzipan and good enough to eat! The directions were clear and easy to follow- simply apply a generous amount after shampooing, leave on for three minutes and then rinse. I liked that the mask gets to work in such a short amount of time, making it convenient to use and easy to fit into a busy routine. I struggled when it came to rinsing the product out- as it is packed with nourishing ingredients such as shea and mango butters, along with mirabelle and apricot kernel oils, I really felt as though there was an oily layer coating my hair which I simply couldn't rinse out, despite trying for quite some time. Unfortunately, the tempting fragrance didn't linger in my hair once it was dry, however, it did feel as though there was still some product residue which may go back to my previous comments regarding the rinsability. Having said this, my hair wasn't weighed down and it looked sleek, shiny and was easy to style. The main problem with this product lies in the rinsability issues- the initial appeal of the mask being an easy-to-incorporate quick fix was undermined by the fact that it took so long to rinse out and even then, it still felt as though there was product residue in my hair which irritated my sensitive scalp. For that reason, I wouldn't purchase a full size of this, even though I enjoyed the scent and the final appearance of my hair. what a shame about the rinsing concerns you had about this product. the rest sounded really good. I've heard good things about this nuxe beauty product. Going on my wish list now!